WASHINGTON, DC, November 25, 2015 (ENS) – The U.S. Environmental Protection Agency says it will vacate its approval of the Dow AgroSciences herbicide Enlist Duo after determining that its combination of chemicals could be more harmful than initially believed. Responding to a lawsuit by conservation groups, in the Ninth Circuit Court of Appeals on Tuesday, the EPA moved for voluntary vacatur and remand of EPA’s registration of Dow AgroSciences’ Enlist Duo herbicide under the Federal Insecticide, Fungicide, and Rodenticide Act, FIFRA. 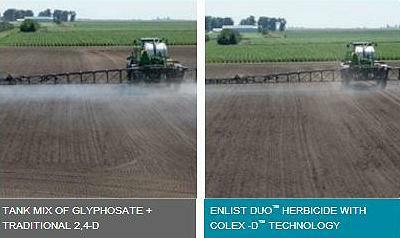 Approved by the agency in October 2014, Enlist Duo is an herbicide developed for use on corn and soybean crops that are genetically engineered to be resistant to the two active ingredients in Enlist Duo, glyphosate and 2,4-D. While the plaintiff conservation groups do not oppose the EPA’s motion to vacate Enlist Due’s registration, counsel for Dow told the court the company intends to file a response to the motion. 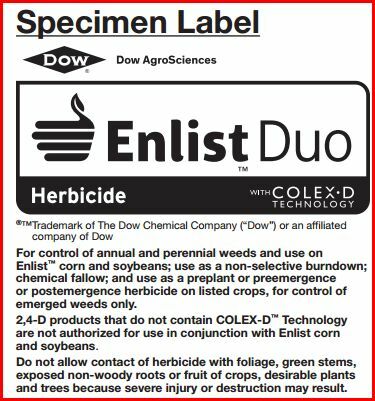 Just after the agency approved Dow’s herbicide, EPA discovered that Dow made claims of “synergistic herbicidal weed control” in its provisional patent application for Enlist Duo. 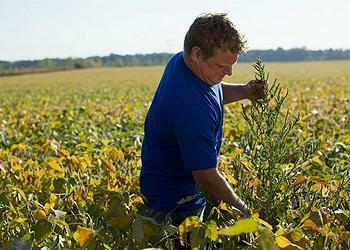 Dow filed its final patent application on December 11, 2014, a month after EPA approved the herbicide. Concern for endangered species exposed to the herbicide is what caused conservation groups to sue the agency. The groups challenged EPA’s failure to consider the impacts of Enlist Duo on threatened and endangered plants and animals protected under the Endangered Species Act. The EPA approval was challenged by Earthjustice and Center for Food Safety, on behalf of Center for Food Safety, Beyond Pesticides, the Center for Biological Diversity, Environmental Working Group, the National Family Farm Coalition and Pesticide Action Network North America. The Endangered Species Act requires that every federal agency consider the impacts of its actions on America’s most imperiled plants and animals and seek input from expert wildlife agencies before acting. “With this action, EPA confirms the toxic nature of this lethal cocktail of chemicals, and has stepped back from the brink,” said Earthjustice Managing Attorney Paul Achitoff. “Too often, GE seeds and the herbicides designed to accompany them are rushed to market without thorough evaluation of their real-world impacts on community health and farmer livelihoods, said Hatcher. The EPA had approved use of Enlist Duo in Illinois, Indiana, Iowa, Ohio, South Dakota, Wisconsin, Arkansas, Kansas, Louisiana, Minnesota, Missouri, Mississippi, Nebraska, Oklahoma and North Dakota, and had intended to approve it in additional areas in the near future. “The decision by EPA to withdraw the illegally approved Enlist Duo crops is a huge victory for the environment and the future of our food,” said George Kimbrell, Center for Food Safety’s senior attorney.